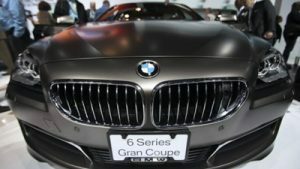 German prosecutors said Monday they had fined high-end carmaker BMW 8.5 million euros ($9.6 million) over diesel cars with higher harmful emissions than allowed, while adding the infraction was down to error rather than deliberate fraud. “Munich prosecutors have ordered a fine of 8.5 million euros for the administrative offence of negligence in quality control,” investigators said in a statement. Authorities had been probing BMW since early 2018 over suspicions it could have built a so-called “defeat device” into some diesel cars. Such technologies allow the vehicle to reduce emissions under test conditions, while emitting far higher levels of pollutants such as nitrogen oxides (NOx) on the road. In Germany, Volkswagen has paid one billion euros in fines over defeat devices following its 2015 admission that it installed them in 11 million cars worldwide, while high-end subsidiary Audi has paid 800 million euros. And last week, prosecutors in Stuttgart said they had opened a “fine proceeding” against Mercedes-Benz maker Daimler over the same suspicions relating to 700,000 cars. But the number of vehicles showing irregularities in BMW’s case is far smaller, at just under 8,000. Prosecutors said that they believed “mistaken labelling of the part of the motor control software responsible for exhaust treatment” was behind increased on-road emissions. “Extensive investigations” had found neither evidence of a purposely designed defeat device, nor of intent to commit fraud by BMW employees, they added. Rather, “the company had not set up an appropriate quality control system” that could have prevented the error or revealed it after the fact, the prosecutors found. Investors appeared little moved by news of the fine, with shares in BMW adding 1.3% at 74.05 euros by 10:30 am in Frankfurt (0930 GMT), against a DAX index of blue-chip shares up 0.5%. In its most recent financial data release, BMW said it made a net profit of 1.4 billion euros between July and September, down 24 percent year-on-year as it contended with tough new emissions tests in the European Union. The post Germany fines BMW 8.5 mln euros over diesel emissions appeared first on SABC News – Breaking news, special reports, world, business, sport coverage of all South African current events. Africa's news leader..